The Kawasaki supplied AUX circuit (activated when you plug in the relay) goes back to a 5 AMP mini blade circuit fuse. The 5 AMP circuit can handle approximately 60 watts total. I intend to use one (not two) 2.1 AMP USB plug-ins and some 20 watt "see-me" LED lights (not true DRLs). This will keep the circuit from blowing the fuse. I would not install a larger fuse because you are entering the smoke/fire realm. Heated grips all by themselves may be dicey on this 5 AMP circuit. I would run the correct stuff supplied from the grip manufacturer. 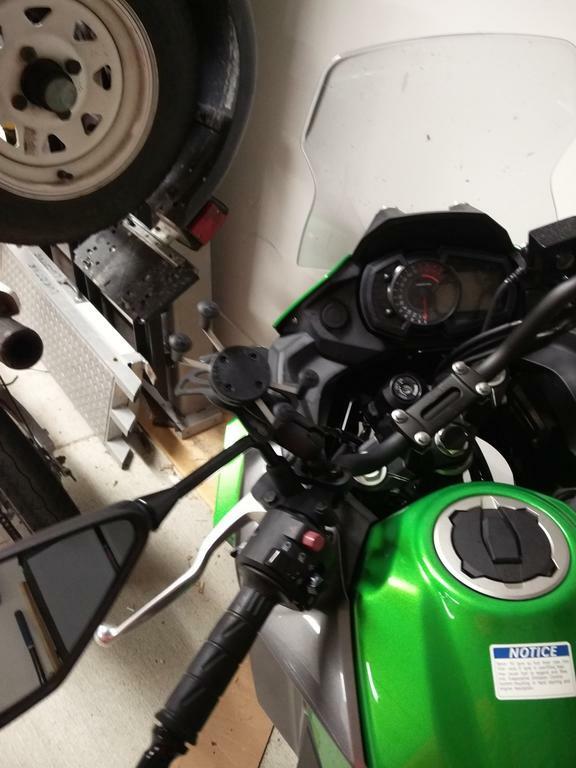 Might want to consider LED head/brake/parking lites to gain back some total wattage for the heated grips. Turn signal LEDs, imo, are a poor return on investment. Here is a neat reference for volt/watt/amps conversion . P.S. ? Anyone know what the white twin barrel (next to the aux barrel connectors) connector is for ? I replaced the headlight and parking light with LEDS. Painted the white parking light yellow. Looks good , don't know if the yellow paint will stay or melt off , lol. Installed the relay , power socket and ran a pair of connectors for future LED see me lights. I had the T-Rex engine guard and Ricochet skid plate already installed. I did not remove the engine guard and removed all the tupperware. W/S and front colored fascia is straight forward. in front center of headlight, two short silver bolts by the overflow radiator tank. OK, the re-install was frustrating so I removed the T-Rex engine guards. The black cowling is tricky, start by aligning the horizontal tab, just above the headlight. Get that right , then replace the two long silver bolts , about dead center of the headlight. tank and evaporated canister. Now, align the silver/green panels and push them on. The two long hex bolts hold the silver (side) panels to the frame. do a re-do sometime in the future. Download the parts diagrams to a PDF, they are truncated online. The two extra/missed push pins are near the turn signals upper black plastic to front cowling.. If I have to get to the wiring, imo, I can do it without taking off the engine guards. Had it in pieces for a while awaiting electrical parts and forgot (age?) some of the tricky stuff. I have the same two push pins spare as well. And two thin screws. I'll be more careful next time. No rattles. I want to install a Powerlet plug somewhere near or in the dash, but not necessarily in the stock hole. In fact, If I could mount it in an alternate location I could install a stock style plug in addition to my Powerlet plug. This is what I had in mind. Is 36" long enough to go from the dash to the battery? I want to direct wire it so I can use it as a charging port. Just watch the total amps limit if you are using the power in the front. I got the relay plugged in. I did not remove any hardware. I can't get enough length on the pigtail to slide the relay into the retaining bar. I don't guess that really matters. There is a retaining wiretie. I see the end but can't figure out a way to cut it. The dashboard plug is on back order. Where do I plug that in? Has anyone here tried this or a similar usb socket with a switch wired directly to the battery? Am I correct in thinking that since it has a fuse, there shouldn't be a problem if it shorts out for some reason? about 8 years ago, i put in a switched auxillary fuse box in my 2008 V. really convenient when it comes to adding farkles. then, i bought a harbor freight 12v for a couple of dollars. i zip tied it to my left handlebar, and there it's been ever since. still works great. remarkably, it doesn't look bad either. I have a fused power connector attached to the frame on both of my bikes for the air compressor if it has a flat direct to the battery but is is basically never used. The power outlet is under the seat to use it. You can also charge the battery from it. 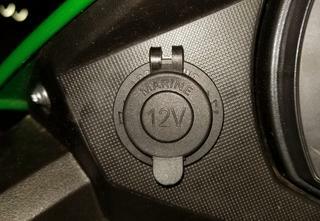 I have an Eastern Beaver 8 circuit fuse box on my V-Strom 1000 but the little power output on the Versus 300 doesn't really merit that IMO. Last edited by SECoda; 08-13-2018 at 01:05 PM. I ended up installing a plain old $6.99 12v socket that I remembered I already have. 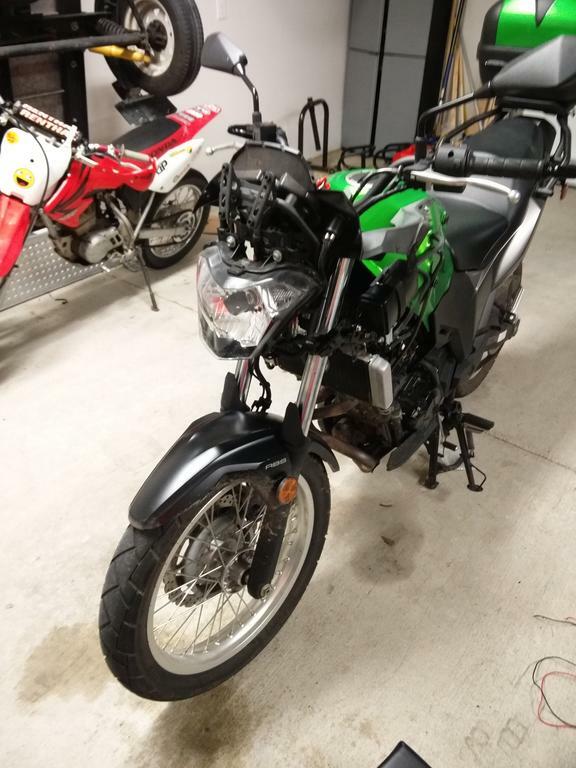 I originally purchased it to put on a scooter, but discovered there wasn't enough space to mount it where I had planned. For now, I wired it directly to the battery with a fuse. But, I plan to add the relay this fall. The Kawasaki relay is only $13.46 at Rocky Mountain ATV/MC, but to get free shipping I'll need to spend $75. So I'll get it when I buy oil and filters for the motorcycles in my household this fall. By the time I get the bullet connectors, the total cost will be less than $25. edit: I forgot to mention that I needed to use a Dremel to make the hole slightly bigger so the socket would fit. Did I miss others doing the same in this thread, or was the socket I used larger in diameter than most? edit #2: I already discovered a problem with the socket I installed. The inner diameter is larger than it should be. So, when I plug in a usb adapter, the fit is not snug. I needed to wrap electrical tape around the adapter for make it fit properly. This fall when I install the relay, I'm going to replace the socket with one that has a usb port so I will not need an adapter. Last edited by CheesyRider; 08-14-2018 at 08:55 AM. Reason: Don't buy the socket I used! 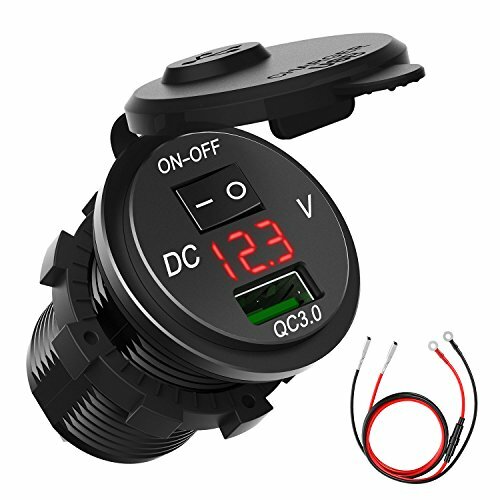 I'm thinking about getting this and wiring it directly to the battery...Has anyone here tried this or a similar usb socket with a switch wired directly to the battery? Am I correct in thinking that since it has a fuse, there shouldn't be a problem if it shorts out for some reason? +1. Always power accessories through a switched source, otherwise one day you will find yourself with a flat battery. I think that I have the very same socket as you. It's great in that you can give the plug a slight clockwise twist to lock it into the socket. I used a rat tail file to open the hole just a little. Plus see below. Why not fit a USB plug on the opposite side of the dash as I have? Then you have future proofed any new purchases. FYI, if you don't want to waste the money on the OEM relay, I found one on amazon that works. It doesnt have the rubber extension that comes down around the connector, but I don't see the lack of that being an issue for me. 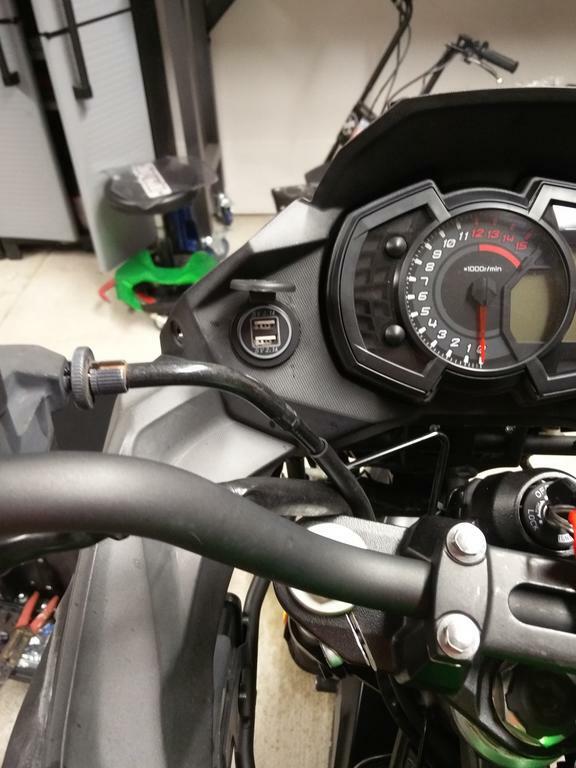 I used it to connect a set of heated grips to the bullet connectors, as I already have a USB charger for a set of battery tender leads. Thanks, used this relay to get my charger set up this weekend.